As custodians of cultural heritage, we are always trying to learn more about the collections within our care. 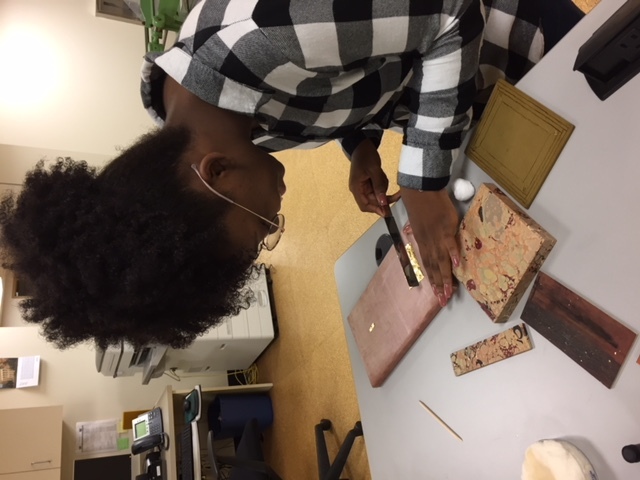 We see many leather bindings come through the lab for treatment that have been decorated in some way. 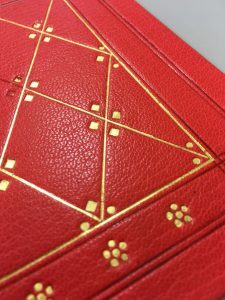 Tooling of leather bindings can be quite complex, and it can be difficult to get a sense of the skill or time required to create those kinds of decorations without trying it for oneself. One afternoon this week, we all gathered together to learn some of the basic techniques for blind and gold tooling by hand. 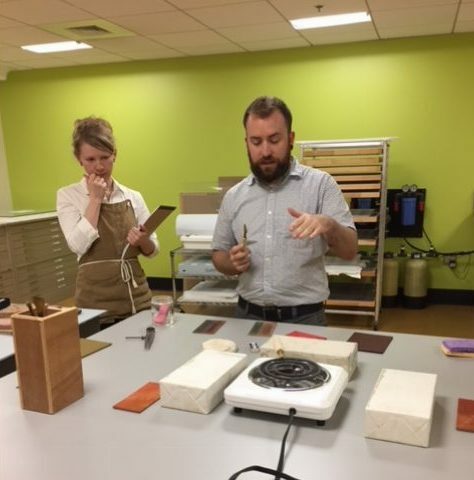 Henry talks through the process and demonstrates tooling. 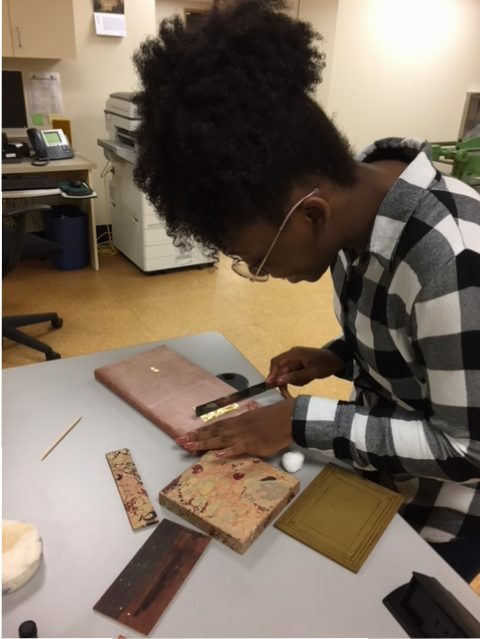 At the most basic level, tooling is accomplished by pressing a heated metal tool into a dampened leather surface. Only a few pieces of equipment are required: brass tools set in wooden handles, a heat source, a cooling pad, a sponge, and suede for cleaning the face of the tool. The process is not complicated, but there are a lot of variables to consider and it takes a great deal of practice to get the right results. 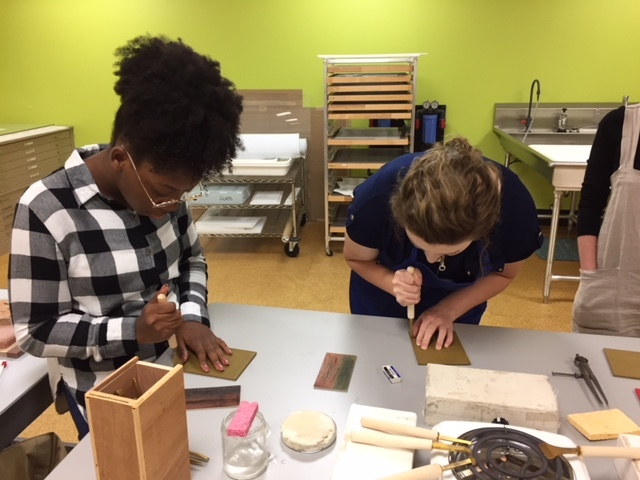 Phebe and Sara tooling plaquettes. 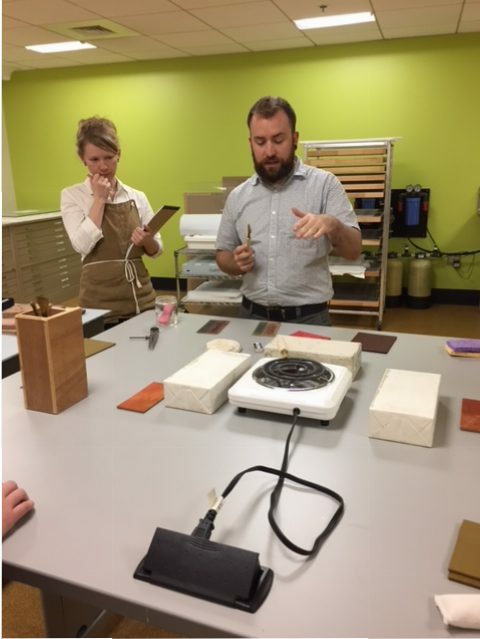 After a short demonstration of making simple lines, everyone got to try it themselves on plaquettes (small pieces of binder’s board, covered in vegetable tanned goatskin). Most of us drew inspiration from the common decorative styles from the 18th century book trade, making concentric panel designs with tooled flowers at the corners. 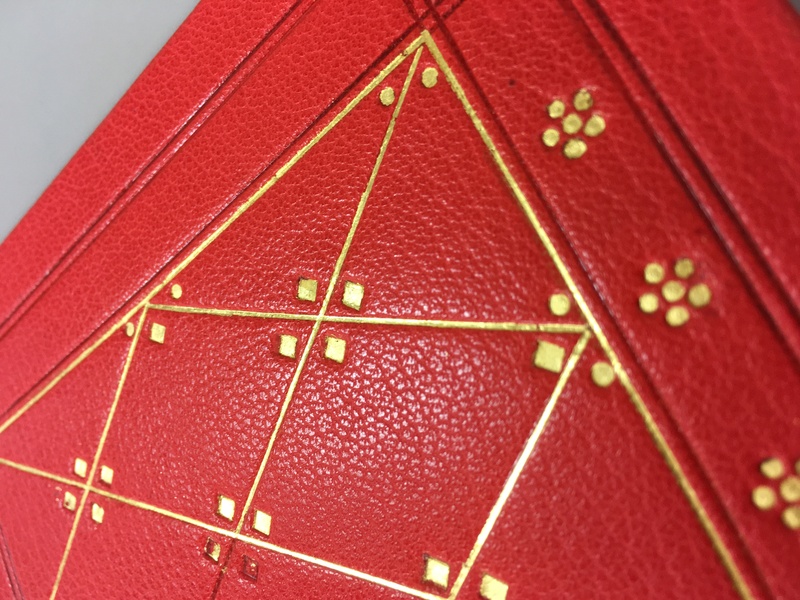 With some blind lines in place, we each tried some gilding. A shellac-based solution called “fixor” is painted into the tooled lines and allowed to dry. 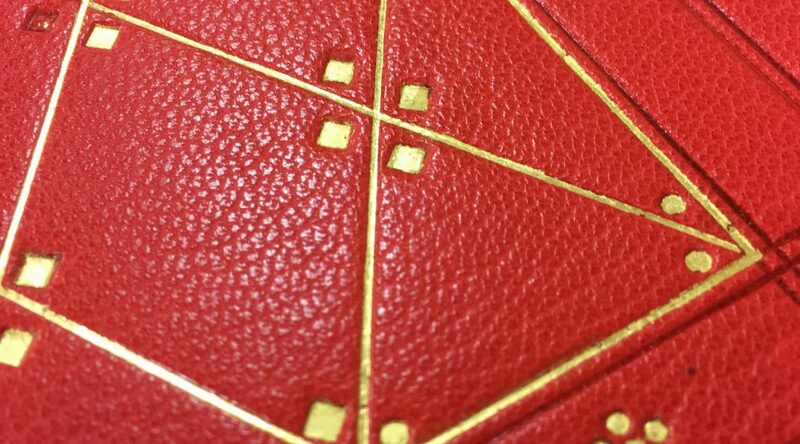 Then, working on a leather cushion, sheets of gold leaf are cut down to size. Phebe cuts gold leaf to size for gilding. If all the previous steps in the process were done correctly, the gold sticks in place and looks very clear and bright. If it doesn’t go so well – then you just start over and try it again. Becoming proficient at finishing takes many thousands of hours of practice, so we couldn’t really develop much skill in just a few hours. But there is something valuable in just trying a craft for oneself. Not only can you learn more about the kinds of marks or characteristic changes that occur when it all goes wrong, but you develop a deeper appreciation for craft done well.